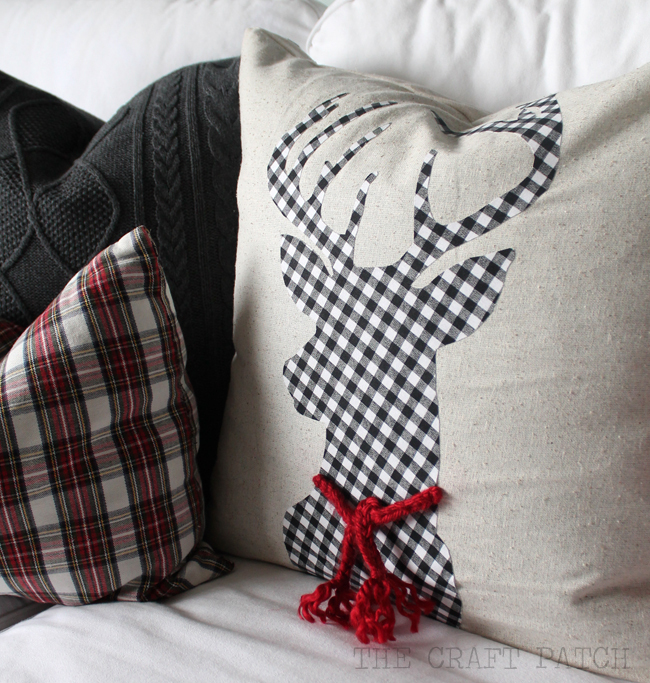 I decided to switch out my bright floral summer pillows for cozy, textured neutrals with pops of red for Christmas. I made all of the pillows on the cheap. That way I don’t feel guilty switching things up whenever the mood strikes. Sweater Pillow: I bought a gray sweater at a thrift store, cut a square from the body of the sweater and sewed it up. I LOVE this pillow. It has so much texture, adds that winter coziness and best of all, I didn’t have to knit those detailed cable designs. It took less than an hour to make! 1. 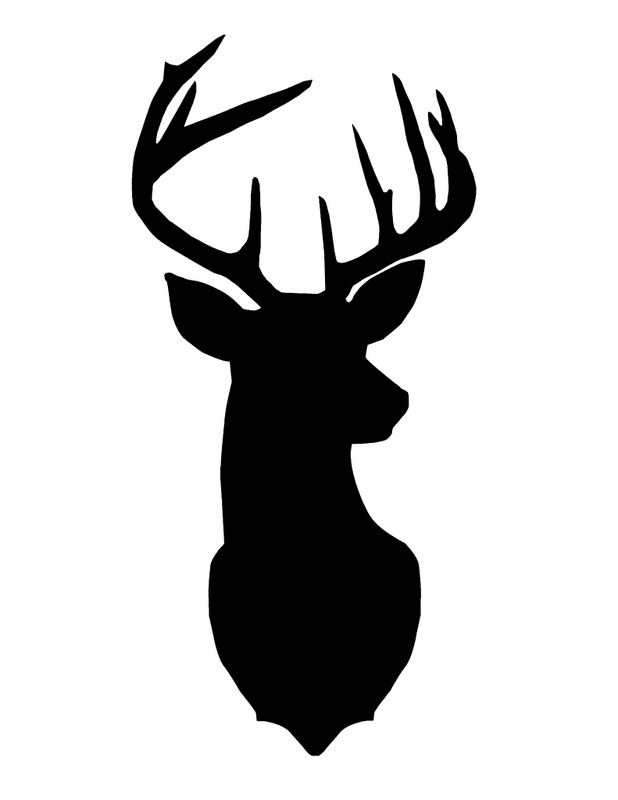 Download the deer template HERE. 2. Iron double sided iron-on adhesive (like THIS) to the back of the black and white fabric (from Joann). 3. 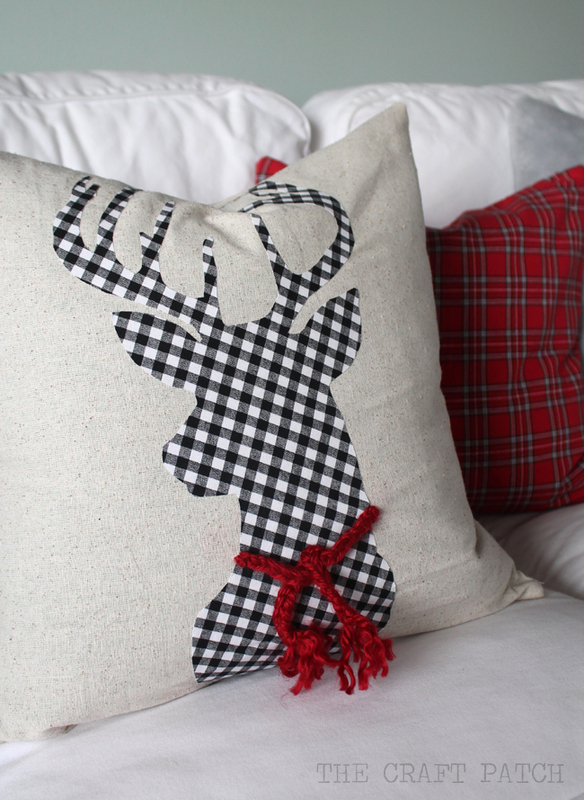 Trace the deer onto the paper backing, peel off the paper and iron it to the pillow fabric. 5. Attach the scarf to the pillow by poking holes in the fabric, stuffing the yarn through, then hot gluing or hand-sewing it down with coordinating thread. I sewed my own pillow cover, but you can buy a really similar looking blank pillow cover HERE for less than $4, and it even has a zipper closure. 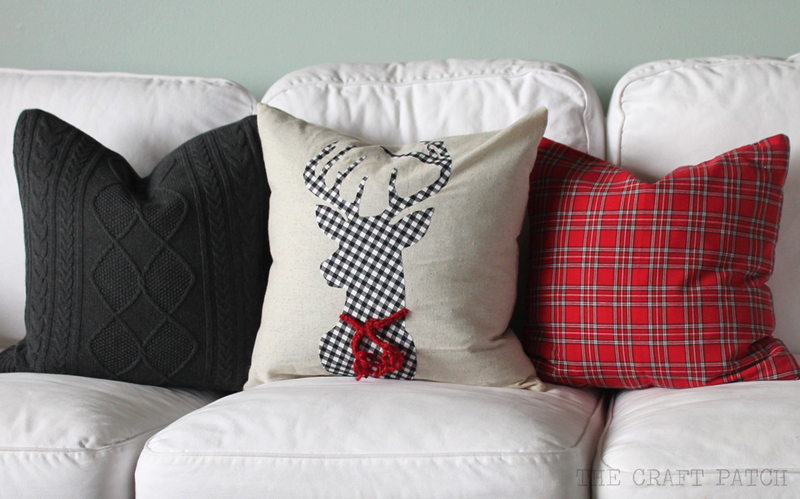 Plaid Pillow: This pillow was the easiest of all. I bought two cloth napkins from Hobby Lobby’s Christmas section and sewed them together. They were half off, so each napkin was only $1.50. It doesn’t get any easier than that! 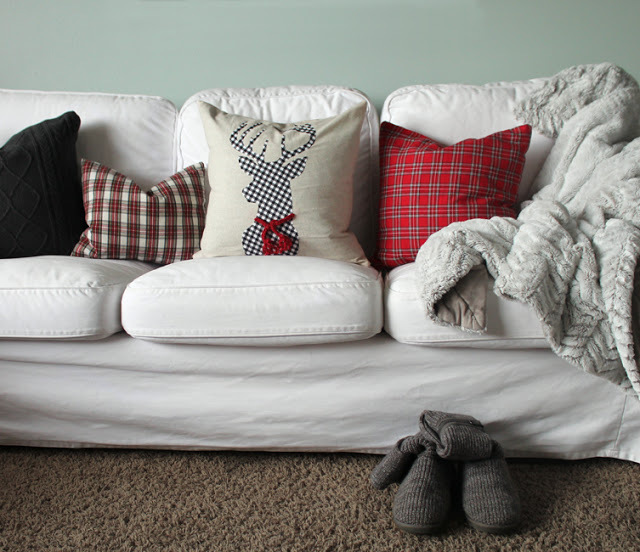 I’m loving my cozy Christmas couch. I curl up under that divine fur throw blanket (from Fred Meyer), sip hot cocoa and enjoy the glowing lights of the Christmas tree. I love these pillows and that they are all upcycled fabrics. The deer pillow is my favorite! I'd love it if you would come link up with us at our Best of the Weekend party that went live last night and is open until Wednesday night. These are awesome! Thanks Jenna! Off to check out your link party! Can you give us a link for the deer printable? Thanks for the printable. I went to the link you provided for the pillow covers, they offer also offer black and grey. Don't think I could make them for the price they are selling them for $2.83 each. While I was there I picked up a few transfers for just $2.08 each. I will be giving these out for Christmas Gifts. Thanks so much for sharing. Love Love Love your pillows. I agree… they are a super steal! The zipper alone would cost close to $2, so it really is a great buy and a great time saver. What size is the deer pillow you made. I printed the deer out and it seems a little small. My pillow is 16"x16". You may need to adjust the size of the deer before printing. 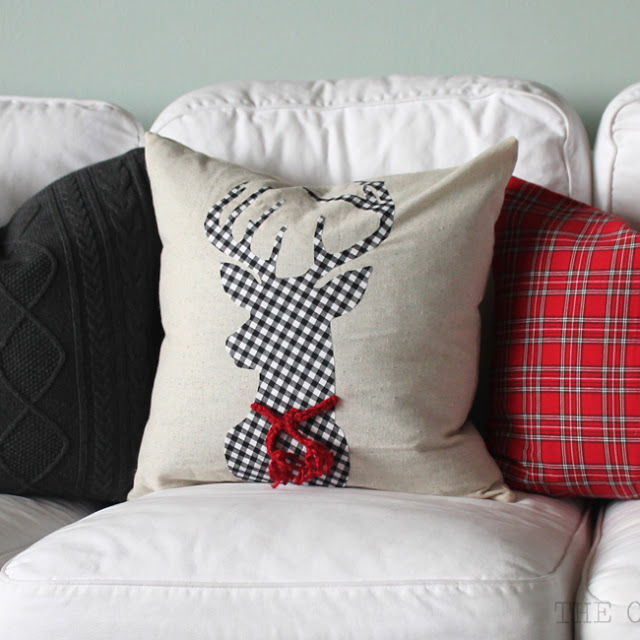 LOVE LOVE LOVE your deer pillow! Could you be more specific (sorry, I'm new to sewing/crafting) as to how to poke holes in the fabric to attach the "scarf"? I really want to try this. I used a thick sewing needle, then poked a crochet hook down inside and wiggled it to stretch the hole out a little. thanks so much for your quick response! I am going to try this on the weekend. Joanne's is having a good sale so I thought I'd take advantage. You're welcome. Have fun crafting! 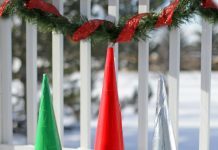 I just found your blog and I'm loving the Christmas decor posts! Needed an easy gift with pillows and this is PERFECT! Thanks! Such a beautiful pillow, love it! I would love to try it as an appliqué? Thank you!